Homemade bousa with bonus homemade glass. At some point in the distant past, an Australopithecus taking a stroll through the East African grasslands ate some rotten fruit off the ground and got a little dizzy and giggly. That hirsute lush was the first of our ancestors to get drunk. But the first hominids to do so deliberately were the people of the ancient world: the Egyptians, Mesopotamians, Chinese and others who stumbled upon the wonderful secret of brewing beer. Beer was invented independently by several civilizations, and may have originally been discovered by accident. If water leaked into an ancient container used to store grain, the excess moisture would cause grain to sprout, releasing new chemical compounds that altered its taste. Moisture would also foster the growth of bacteria and yeast, which would feed on the grain and produce alcohol as a waste product. And if some curious Egyptian or Sumerian (perhaps a direct descendant of the aforementioned Australopithecus) decided to taste the leaky drippings of that improperly sealed jar–bam! A life-changing discovery. Some archaeologists believe it was the rise of beer-making that directly inspired early humans to transition from a hunter-gatherer to an agricultural economy. That is, the ancients planted grain for beer before they planted it for bread. 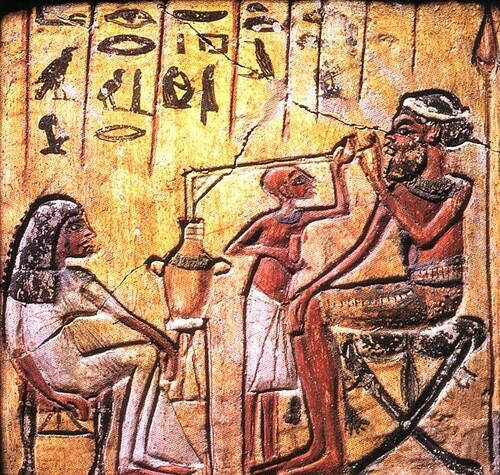 Ancient Egyptian beer, called bousa, was a dietary staple. With more nutrients and less alcohol than modern beers (about 2%), it could be drank throughout the day and was actually safer to drink than water due to the lack of modern sanitation. Laborers were often paid in beer rations (the workers on the Great Pyramids at Giza received 4-5 liters a day). Beer was served at every Egyptian meal, especially among the lower classes. Multiple people often shared the same beer vessel using long reed straws, creating a visual effect similar to 1950s teenagers sharing an ice cream float (or modern college kids sharing a fishbowl of liquor and fruit juice at that one restaurant that doesn’t card). The straw was both social and practical: bousa is a lumpy semisolid rather than the liquid we might expect. 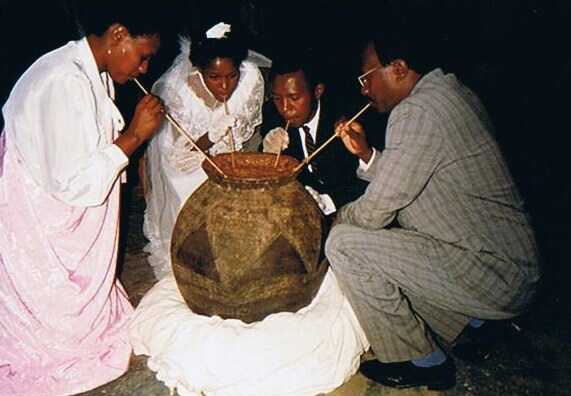 The custom persists in some African cultures that make beer in a similar manner (here’s a picture of people sharing beer with straws at a wedding in 1980s Burundi). Written sources record various kinds of beer flavored with different ingredients and given poetic names like “Friend’s Beer”, “Iron Beer”, or “Beer of the Protector”. Some of these variants were only made for special occasions, such as the annual “Festival of Drunkenness“. On that day, Egyptians indulged in a beer dyed red with pomegranate juice or powdered ochre (a kind of mineral clay) in honor of the ferocious lion goddess Sekhmet. According to legend, Sekhmet once threatened to devour all of Egypt, until she was tricked into thinking the red-dyed beer was blood. Literally bloodthirsty, the goddess chugged a few barrels and passed out, sparing the Egyptians from her hunger. Sekhmet was one of several goddesses associated with beer in Egyptian mythology. Viewed as an offshoot of bread-making, beer-brewing was considered a largely feminine activity. First, we will malt the grain, meaning we’ll allow it to sprout and then roast it. Soak one cup of wheat berries in a bowl of water at room temperature for 8-10 hours/overnight. Drain the wheat berries and place them in a large glass jar. Cover the jar with a light cloth, such as cheesecloth, secured with a rubber band. Let stand at room temperature for 1-3 days or until you see little tails sprouting from the grains. During this time, make sure the grains stay moist but not submerged in water. Once a day, shake the jar gently to help air circulation. Once your grains have sprouted, spread them on a baking sheet and roast them at 300 degrees Fahrenheit for about 3 hours. When done, they should be completely dry and dark brown and give off a pleasant, nutty aroma. Grind the malted grains into coarse flour in a food processor or with a mortar and pestle. Some Egyptian beers used bread as a starter yeast culture, and others used grain porridge, as confirmed by archaeological evidence. We’ll be making a porridge-based beer. Boil two cups of barley in two cups of water until you have a soft, mushy porridge. It should be soft enough that you can break an individual barley grain with the edge of a spoon. When your barley porridge is no longer boiling hot but still warm, put it into a pot with the ground-up wheat berries from the previous step and six cups of water. Cover and let sit at room temperature for 3 to 4 days. When you uncover your Egyptian beer, the first thing you’ll notice is that it smells like it’s gone bad. This, of course, is because it has. The smell will dissipate completely if you take off the lid and let it air out for a while. It’s safe to drink, I promise! And it tastes completely different from the off-putting initial aroma. Very lightly sour and fizzy, with a little bit of smokiness from the roasted grain. You can also try sweetening it with honey or date syrup, or mixing it with pomegranate juice if there’s a lion-headed goddess you’re trying to intoxicate. This beer is not bad, but it’s also not something I could picture myself ordering at a bar. The rank smell means that I have to rank it behind my Mesopotamian beer recipe, which I’ll share another time. III out of X. * Adapted from Cooking in Ancient Civilizations by Cathy Kaufman (2006).